We’d love your help. Let us know what’s wrong with this preview of Blindspot by Mahzarin R. Banaji. These self-perceptions are challenged by leading psychologists Mahzarin R. Banaji and Anthony G. Greenwald as they explore the hidden biases we all carry from a lifetime of exposure to cultural attitudes about age, gender, race, ethnicity, religion, social class, sexuality, disability status, and nati I know my own mind. To ask other readers questions about Blindspot, please sign up. What do you think about this book for a first timer reader, is it difficult or it's easy to read and understand? I made it almost halfway through the book and then realized I am under no obligation to finish something I find this dull and obvious. Your Cliff Notes for this book: Humans like categories and are very good at recognizing patterns. Humans live in cultures. Cultures tend to be homogeneous and distrust "otherness." Individuals pick up these biases from their cultures. As society has evolved (which, looking at daily headlines, is a questionable assumption), prejudice/bias is now considered "b DNF. Your Cliff Notes for this book: Humans like categories and are very good at recognizing patterns. Humans live in cultures. Cultures tend to be homogeneous and distrust "otherness." Individuals pick up these biases from their cultures. As society has evolved (which, looking at daily headlines, is a questionable assumption), prejudice/bias is now considered "bad." We know consciously that it's "bad" to be prejudiced, but we don't usually realize how much bias/prejudice we subconsciously have absorbed and act on; however, if you become aware that you have a tendency toward unconscious prejudices, you can consciously work to overcome them. There really isn't much new here. Maybe the authors created a new tool to measure just how biased we are, but I remember the same basic ideas presented in my 80s-era psych and sociology classes. My real (biased) takeaway on this: Research psychologists need to get out in the real world more where the things they think they are "discovering" are fairly obvious to those of us who have ever been on the receiving end of bias...which is pretty much anyone who has ever interacted with someone not exactly like him/her. Note: Usually I don't affix a star rating to books on my DNF/abandoned list. That said, I make exceptions if A) I've gotten more than 1/3 of the way through the book before giving up, and/or B) I thought the book especially inane, insufferable or just plain old awful. This was an all-faculty read at my school. To be honest, if you've got any passing familiarity with the general coverage of issues of race, racism and identity going around in the press for the last several years, you're likely going to have heard much of this before. Nonetheless, it does gather a lot of what you've likely read together and put together in a lucid, linear structure, walking the reader through neuropsychological structures that can lead to negative stereotypes forming, from our b This was an all-faculty read at my school. To be honest, if you've got any passing familiarity with the general coverage of issues of race, racism and identity going around in the press for the last several years, you're likely going to have heard much of this before. Nonetheless, it does gather a lot of what you've likely read together and put together in a lucid, linear structure, walking the reader through neuropsychological structures that can lead to negative stereotypes forming, from our brain's tendency to sort things into categories to the book's extensive discussion with the results of the Implicit Association Tests (IATs) out of Project Implicit at Harvard, and what that reveals about the implicit biases of the millions of Americans who have taken the test. If you're not familiar, first, you should definitely go take at least one of the tests to get the idea. And second, according to the scientists involved, the IAT tests prove that at over 75% of Americans who have taken the test show strong implicit biases, whether that be in the area of race, gender, age, or any other category tested. Even more strikingly, this was true whether or not they held views contrary to what the test showed their implicit bias to be. With regard to race, at least a sizable minority of white Americans who have strongly held egalitarian views nonetheless show strong implicit bias toward associating negative or violent images with African Americans. A majority, as of the writing of the book, of people who believe in gender equality nonetheless still had strong implicit associations of women with the home and as not being equally as good at math and science. The conclusions reached are, then, not particularly surprising: there is a significant chance you probably have some level of implicit bias, and implicit bias has been proven to lead to discriminatory behavior, which is proven to impact the groups that you are have some level of negative bias towards. And you may need to expand your definition of what both "bias" can mean and what "discriminatory behavior" is. The book is structured for any person inclined to read this research and say something defensive like, "But I'm a good person who is nice to others around me!" or "I would never lie, ever!" or "I don't believe in and would never take any racist action!" to be able to have that reaction, be told that's a great start, but here's why you're wrong or at least that there's a whole lot more to it than that. So if you know someone like this, this would be a good book to give to them so you don't have to explain. It's written largely for that person. Your brain associates concepts, and it doesn't always tell you. Drs. Banaji and Greenwald give a great illustration to introduce the testing method that forms the basis for most of this book: imagine that you have a deck of shuffled cards, and you're told to separate them into two piles. Hearts and Diamonds go to your left, and Spades and Clubs go to your right. You can probably do that really quickly, without even having to think, since your brain can just associate the pairs into "Red goes lef Your brain associates concepts, and it doesn't always tell you. Drs. Banaji and Greenwald give a great illustration to introduce the testing method that forms the basis for most of this book: imagine that you have a deck of shuffled cards, and you're told to separate them into two piles. Hearts and Diamonds go to your left, and Spades and Clubs go to your right. You can probably do that really quickly, without even having to think, since your brain can just associate the pairs into "Red goes left, Black goes right" - but if you have a different prompt, like Hearts and Spades go to the left, and Diamonds and Clubs go to the right, you will have to slow down a little. It's not that you can't make up an easy rule or that the question is hard, it's just that your brain has been trained to make an easy association among suits of the same color, so you have to put in just a little more thought when grouping ideas that seem to have less in common. On this principle, the authors explore the Implicit Association Test to determine what other concepts people's brains have developed in associated groups. For example, you may see a list of words, and for every word that is either a Flower or a Pleasant word, you mark the circle on the left, and for every word that is a Bug or an Unpleasant word, you mark the circle on the right. More likely than not, you will be a little faster at this task than if the words were grouped differently. Where the test gets interesting and psychologically useful, of course, is where it touches on issues of race/gender/age/sexuality/etc. Most people, especially in the relatively sophisticated target audience of this book, honestly insist that they do not discriminate, so the benefit of this testing method is that it unearths biases about which the subject is unaware. If your brain takes a little longer to group, say, a traditionally feminine name with a career word, as opposed to a domestic word, you may have some gender bias affecting your actions and decisions in ways you don't realize. I was familiar with this testing method before I started reading the book, since Dr. Sam Sommers uses it in Situations Matter: Understanding How Context Transforms Your World, but I was pleasantly surprised to see how thoroughly these authors explored the implications of what the test has shown over the last twenty years or so. There are real links between implicit preferences for one race over another and subtle discrimination (like a doctor's bedside manner), and the scientific community is just beginning to develop experiments to learn more. The book definitely made me ask myself hard questions and look for my own blind spots, and it is certainly a good read for anyone interested in issues of equality. Where I think the book falters a bit, understandably, is that it is very descriptive without being prescriptive. The authors are candid about this aspect of the book, almost apologizing for conclusions that boil down to, "We can show scientifically that people discriminate even when they don't know they're doing it. We just don't know how to fix that." Certainly, there are a few solutions offered (when an orchestra began holding blind auditions, for example, the gender ratio among accepted musicians became much more even, and students who take math classes from female professors are able to significantly increase their implicit associations between women and math), but I get the sense that we are still a few significant studies away from a book with large-scale concrete solutions to the problems described in this volume. I have hope that such a book is on the way someday, so for now, I can recommend this book for a thorough and patient analysis of the problem while we wait for the book to suggest more solutions. Good book, but it’s a few years old, so unfortunately didn’t include the latest bias research. There wasn’t new information. If you’ve read Malcolm Gladwell’s Outliers, and probably a few other books, you won’t likely gain much from this one. 3.5 stars. I highly recommend this book. It explores in-depth the finding that unconscious attitudes can influence people's actions without their knowledge. Using data obtained using the Implicit Association Test (developed at Harvard), the authors make a convincing case to convince the reader that, yes, you probably are prejudiced in ways you don't know, and yes, those prejudices impact your actions in ways which would horrify you if you knew about it. It's another way to understand what "white privilege" I highly recommend this book. It explores in-depth the finding that unconscious attitudes can influence people's actions without their knowledge. Using data obtained using the Implicit Association Test (developed at Harvard), the authors make a convincing case to convince the reader that, yes, you probably are prejudiced in ways you don't know, and yes, those prejudices impact your actions in ways which would horrify you if you knew about it. It's another way to understand what "white privilege" is all about. No judgement; just facts. And these facts are pretty hard to ignore. Approximately 75% of Americans (of all races and ethnicities) demonstrate automatic White preference on tests of their unconscious attitudes. These attitudes are not chosen, and are often contrary to what the person believes in their conscious mind (eg: all races are equal). Still, the unconscious preference for and willingness to help people who are white continues to poison all areas of our society, hurting anyone who is not white. The insight provided by this book is invaluable as we ponder the death of Trayvon Martin; the overpopulation of our prisons with people of color; stop-and-frisk policies in NYC; and our own wishful thinking about living in a "post-racial" society. Interesting insights, boring delivery. Half the book is about racial stereotyping, which seems to be a hot media issue these days. You might think that this book about how everyone harbors some level/version of prejudice, but it's actually about how YOU harbor some level/version of prejudice. Even if you don't know it. Interesting but repetitive. It was repetitive and there were some good observations but it was very repetitive. Didn't finish the book. This is a book about the unconscious biases of good people. The book centers around the results from implicit association tests. Many of us in 21st century America are conscious egalitarians. We consciously believe it is wrong to discriminate on the basis of race,class, gender or sexual orientation. However unfortunately we carry unconscious biases which we largely have no control over. These biases show up on an implicity association test. the test usually involve rapidly responding and clicki This is a book about the unconscious biases of good people. The book centers around the results from implicit association tests. Many of us in 21st century America are conscious egalitarians. We consciously believe it is wrong to discriminate on the basis of race,class, gender or sexual orientation. However unfortunately we carry unconscious biases which we largely have no control over. These biases show up on an implicity association test. the test usually involve rapidly responding and clicking on appropriate word that is either positive (good, great, beautiful...)and a negative word (bad, lowly, ugly...) and putting it quickly with as few errors as possible in the right category. At the same time one is sorting words on must sort races. You might be asked to sort good and bad words and pictures of people of different races into the good and bad categories. On the first try you may separate white faces with good and black faces with bad then you will be asked to separate black faces into good and white faces to the bad. By measure the lag time in the test takers sorting unconscious bias is measured. I was curious how I would do on the test and found a website with the test online. I was relieved that I had almost no unconscious bias. Weirdly enough the tiny unconscious bias I did have was against white people and not for them. This was a strange result. I am relieved but it is not a badge of honor since I have no control over my unconscious mind the results could well have been different. For anyone who likes the genre of books like Freakonomics and The Tipping Point this is a great read. And for anyone else whose interested in the intersection of science and behavior with issues like structural racism and sexism (and plenty of other 'isms'), I'd highly recommend this book. Implicit-Association Test (IAT) is a relatively new social psychology test designed to "detect the strength of a person's automatic association between mental representations of objects in memory." It makes a For anyone who likes the genre of books like Freakonomics and The Tipping Point this is a great read. And for anyone else whose interested in the intersection of science and behavior with issues like structural racism and sexism (and plenty of other 'isms'), I'd highly recommend this book. Implicit-Association Test (IAT) is a relatively new social psychology test designed to "detect the strength of a person's automatic association between mental representations of objects in memory." It makes a scientific case beyond our stereotypes and prejudices, while not at all excusing behavior, but rather taking a more analytic approach to mitigating the negative impact of those biases. This book, I believe must be read by almost anyone who is unaware of the idea of Implicit Association (as I was). The main text is only 167 pages, the rest is Appendices, Notes and Index. For the 167 pages of text, the information content is very good. At the heart of it, the book explains the presence of blindspots, i.e. presence of implicit associations that our brain makes, without our conscious awareness, between groups and certain characteristics/properties. Such unconscious bias may (and u This book, I believe must be read by almost anyone who is unaware of the idea of Implicit Association (as I was). The main text is only 167 pages, the rest is Appendices, Notes and Index. For the 167 pages of text, the information content is very good. At the heart of it, the book explains the presence of blindspots, i.e. presence of implicit associations that our brain makes, without our conscious awareness, between groups and certain characteristics/properties. Such unconscious bias may (and usually does) lead to (invisible) discriminatory behaviour - as happens for example, while choosing a boss or employee of a particular gender, or choosing to help a particular type of individual/group thereby increasing its privileges, and so on. The authors include Implicit Association Tests (IATs), designed to reveal such blindspots, within the book. They also support their claims by describing a lot of experiments/data, most of which were fun and interesting. A simple IAT they begin with, reveals unsurprisingly, that people usually associate pleasant feelings with flowers, and unpleasant feelings with insects. A more complex one is the race IAT, which found that people (about 70% of test takers) associate pleasant feelings with White children as against Black ones, even when they claim to be perfectly egalitarian and indeed are consciously so. This review has been hidden because it contains spoilers. To view it, click here. A wonderful book, written respectfully, kindly but not hiding nor softening the truth. Excerpt From: Mahzarin R. Banaji. 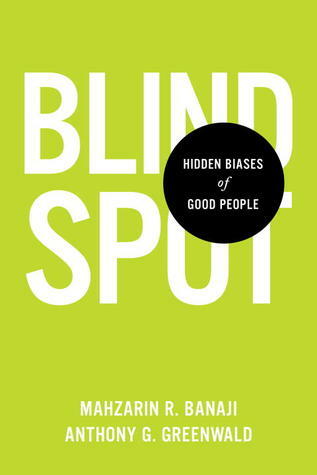 “Blindspot: Hidden Biases of Good People.” De A wonderful book, written respectfully, kindly but not hiding nor softening the truth. Iʻve listened to it a few times, while doing other stuff, and with pretty fast pace. Full disclosure, I could only skim. This is very basic and workable for someone with almost no knowledge of implicit associations, equity, or modern life. I’m assuming three stars for someone new to this material. This book is about evidence-based studies about implicit association/unconscious bias/cognitive dissonance, and although it is not quite popular science, the tone is conversational and accessible. The authors fully concede their own biases, and that helps humanize the findings. Also, taking the Implicit Association Tests that the authors developed is VERY eye-opening. Unfortunately, the book is short on solutions (because are there really any? ), but it's worth the read to get a better sense of how biases are at work in everyday behavior. Below I included the questions I used for my book club discussion at work, plus lines of note to me. 1. Before reading this book, how familiar were you with the concept of implicit association/unconscious bias? How did that affect how you approached the book? How have any of your ideas on the topic changed or evolved? 2. The authors define a category as “a collection of things having enough in common so that it is convenient to treat them as kin,” and they use social categories like race, ethnicity, and gender in a lot of examples. What other categories do we use to create shortcuts? How does that affect behavior and decisions? 3. The “Us and Them” chapter talks about in-groups and out-groups. When have you been a part of one or the other? What did that look like or feel like? 4. How can we help each other avoid blindspots? I "wooooow!! "ed so many times! I've studied this for yearz, but I still was surprised by some of the findings detailed. Like people will sacrifice $4000/year to have a male boss even though they THINK they have no preference?? Or that people associate famous White foreigners with "American" more easily than famous Asian-Americans with American. As in Hugh Grant is more American than Connie Chung. Yikes!! I read this in preparation for a presentation I'm giving, and I found it interesting and informative. If you're already familiar with the Implicit Association Test (IAT), then much of this book will be a review. But it's hard to dock the book stars for that when its authors are the creators of the IAT. Although most of this research wasn't new to me, it's still important. If you're not familiar with implicit bias, I'd highly encourage you to read this book. This book is an excellent introduction to the concept of implicit bias and Implicit Association Tests. I've taken several IATs online, and I have some serious work ahead of me to counteract the implicit biases I have. The book is written in very accessible language and makes its point well. Don't stop reading at the end of the text--the appendices may be even more crucial than the book itself! I highly recommend this book. I appreciated the chance to think about our unconscious biases, and how they might shape our attitudes and relationships. These are undoubtedly important ideas. But the book felt repetitive, and I didn't feel that I got a whole book's worth of insight out of reading it. Not a lot of new information when it comes to my scope of knowledge, but enjoyed the studies and little activities nonetheless. I don't wanna downplay it because it's an important read for sure, but def. okay to skim through some parts. Really interesting research which will (hopefully) inspire the reader to take multiple Implicit Association Tests. Everyone should take those tests; the results are invariably eye-opening. I expected more from this book, but it was still good. I liked the differentiation between explicit and implicit and the discussion on how we can have two different beliefs. Contrary to some beliefs, the battle against racism in the USA is still being fought. It is not and never has been a "one-and-done" effort. One of the more crucial things people must understand is how pervasive racism is. Our country was built on it, thrived on it, and still does. For generations, the rhetoric of racism was painted in broad, binary strokes: racism - bad, anti-racism - good; racist - bad, non-racist - good; torches, swastikas, white hoods, ugly words, overt discrimination, violenc Contrary to some beliefs, the battle against racism in the USA is still being fought. It is not and never has been a "one-and-done" effort. One of the more crucial things people must understand is how pervasive racism is. Our country was built on it, thrived on it, and still does. For generations, the rhetoric of racism was painted in broad, binary strokes: racism - bad, anti-racism - good; racist - bad, non-racist - good; torches, swastikas, white hoods, ugly words, overt discrimination, violence = racist, avoid those things = non-racist. Things are more nuanced than that and sticking to this elementary understanding prevents forward progress. The mechanism that keeps more subtle, socially acceptable racism alive and thriving is implicit bias. It lives in all of us, mostly unchallenged. It is difficult to see, easy to deny, and our images of ourselves as good people in a just, fair and equal country depends on denying it exists or still influences us. Banaji and Greenwald define implicit bias and provide several examples of how good people act on implicit bias. They review several studies and their results, delving deeper into implicit bias, how it shows up, and how it hides. They go so far as to offer URLs for implicit bias tests, allowing the reader to take the test themselves as the book examines and unravels implicit bias and its manifestations. Racism stands as the primary focus of the book, but the authors make it clear through word and example how implicit bias also applies to many -isms existing in our country's society. As they mention, race has merely been the foundational and systemic prejudice studied most often. These guys developed a test called the IAT test. IAT stands for Implicit Association Test, which is to test how you react to something unconsciously, mainly in terms of stereotypes. The test tries to see how we associate positive or negative words with different stereotypes. For example, it tells us to click a certain keyboard (if the test is online) button for any word on the screen that is positive (such as good, wonderful) and then do the same for a picture of a black person (we should press These guys developed a test called the IAT test. IAT stands for Implicit Association Test, which is to test how you react to something unconsciously, mainly in terms of stereotypes. The test tries to see how we associate positive or negative words with different stereotypes. For example, it tells us to click a certain keyboard (if the test is online) button for any word on the screen that is positive (such as good, wonderful) and then do the same for a picture of a black person (we should press the key for positive, rather than negative). The tests are available online and I took several tests, and it did show me how, even me as a non-western, non-white, non-Christian, individual have so much implicit associations that are probably influenced by the mass western media. I associate more positive words to white people than black people. I rate Christianity higher than Islam. I understand certain of my own biases (of course, I have sexist inclinations, no test is going to surprise me over that), but there is still a somewhat uncomfortable truth to why the ones that are different. Specially, when it comes to skin color and religion, because these are not my adapted norms. But shows how powerful media is. Compelling book that focuses in particular on our own self awareness & unconscious bias. The fact that 75% of African Americans feel more comfortable & at ease around Whites than blacks was stunning to me. In the book they interviewed Malcolm Gladwell who is biracial & after taking the tests it told him he was more comfortable around whites even though his mother is black! But this book steps into unconscious biases that we think we can overcome (and we are aware we do) but that for m Compelling book that focuses in particular on our own self awareness & unconscious bias. The fact that 75% of African Americans feel more comfortable & at ease around Whites than blacks was stunning to me. In the book they interviewed Malcolm Gladwell who is biracial & after taking the tests it told him he was more comfortable around whites even though his mother is black! While not well written (always a deterrent in recommending a book), this cites study after study to explain why we THINK we think one way, but actually think another. The subtitle about "hidden biases" will frighten off anyone who hasn't already become aware that what they wish they believed is not always consistent with how they act. Using layman's analyses of evolutionary biology, the authors explain how humanity has been predisposed to prefer those "like us," then exposes how arbitrary our de While not well written (always a deterrent in recommending a book), this cites study after study to explain why we THINK we think one way, but actually think another. The subtitle about "hidden biases" will frighten off anyone who hasn't already become aware that what they wish they believed is not always consistent with how they act. Using layman's analyses of evolutionary biology, the authors explain how humanity has been predisposed to prefer those "like us," then exposes how arbitrary our definitions of "like us" are. A telling example is of an ER doc who sizes up a patient with a severe gash as a good candidate for surgery right in the ER, until her overhears someone recognize the patient as "Dr. X," at which point an expert hand surgeon is called. Perceiving the patient as "like him" (a professional), he suddenly understands that a basic surgery would be inadequate and that she needs major care. Hidden bias indeed.